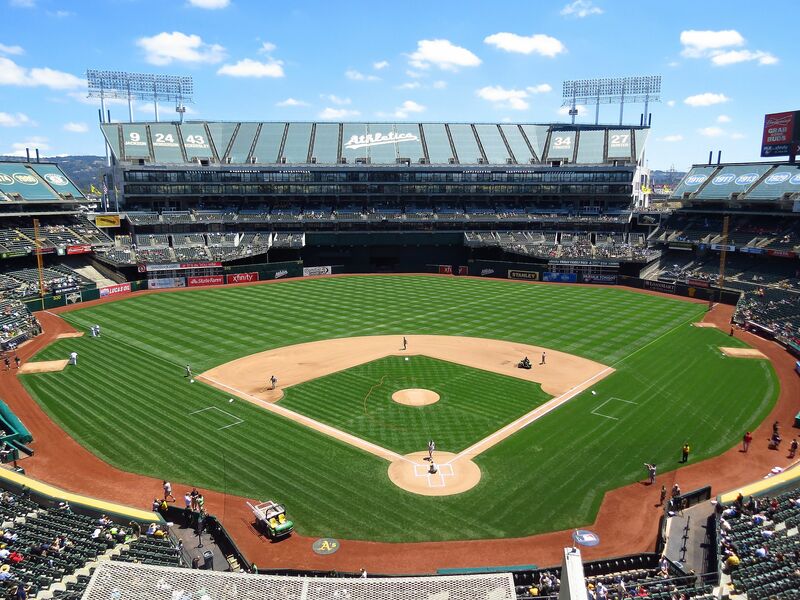 There is hope yet that despite losing the Raiders to Las Vegas and the Warriors to San Francisco, Oakland will be able to keep its professional baseball team in the city over the coming years. 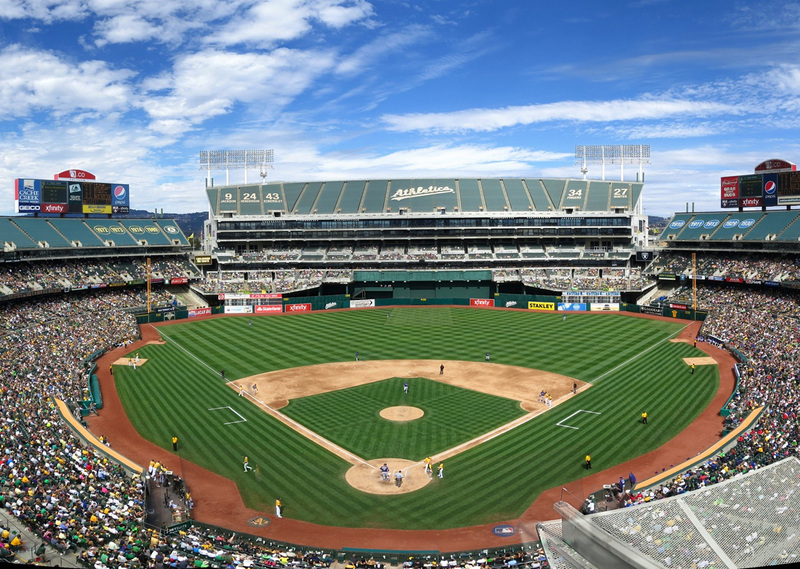 Oakland mayor Libby Schaaff signed a select agreement today with the Oakland Athletics that would position the city to deal exclusively with the team as they look for a new home somewhere along the Oakland waterfront. The agreement was announced during a press conference attended by the mayor and team president David Kaval. 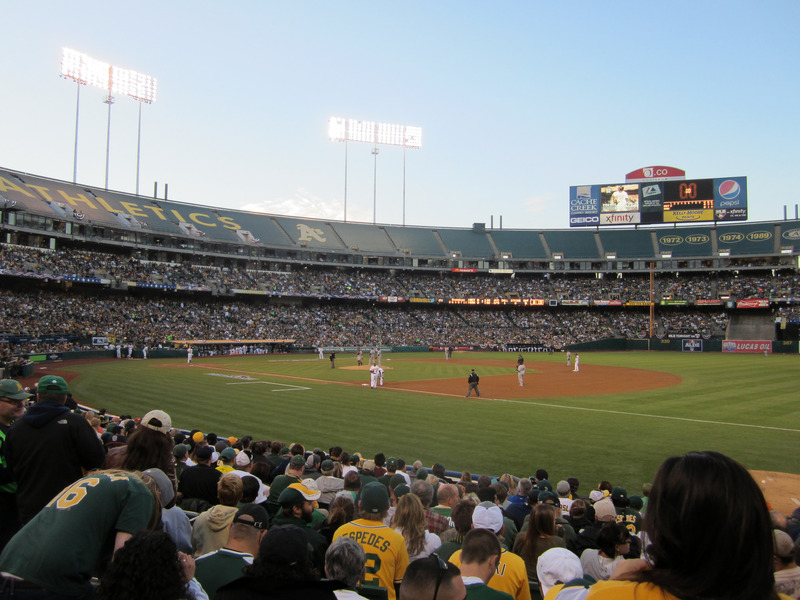 The Oakland Athletics are currently in the process of figuring out what to do and where to go as their aging stadium—currently shared with the Raiders—prepares to lose the football team in either 2021 or 2022. “We are trying to make sure we retain as many options as possible so we can remain ‘rooted in Oakland,’” Kaval said, according to Mercury News. 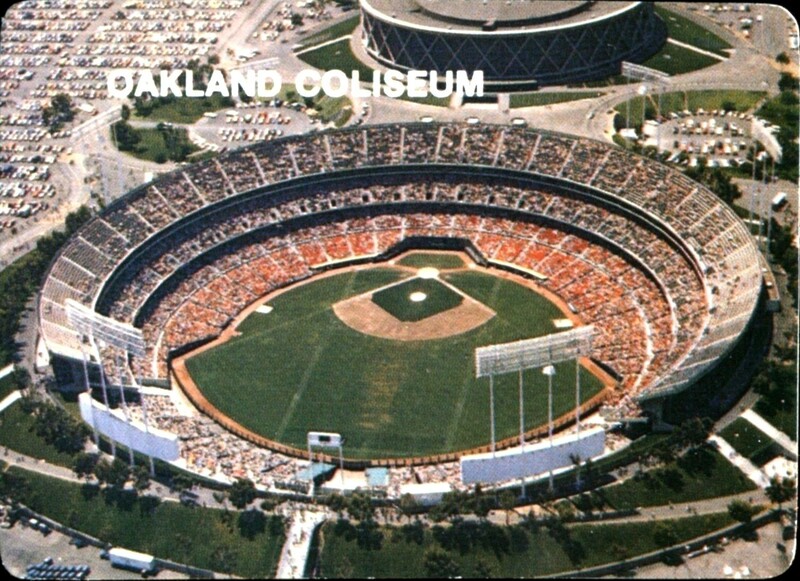 The city of Oakland currently owns the site of the Oakland Coliseum, the last remaining dual-purpose professional sports stadium in the country, which the Athletics are interested in purchasing outright. 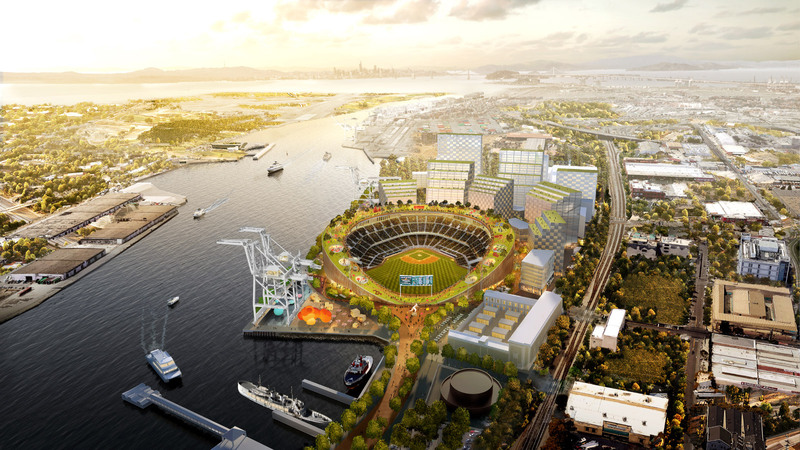 The team has expressed interest in the 120-acre site, including the adjacent Oracle Arena basketball stadium, in an effort to establish ownership of their playing facilities. The current facilities are easily accessible to the region’s mass transit system and feature extensive surface parking. Estimates put the cost of buying the property at $135 million. 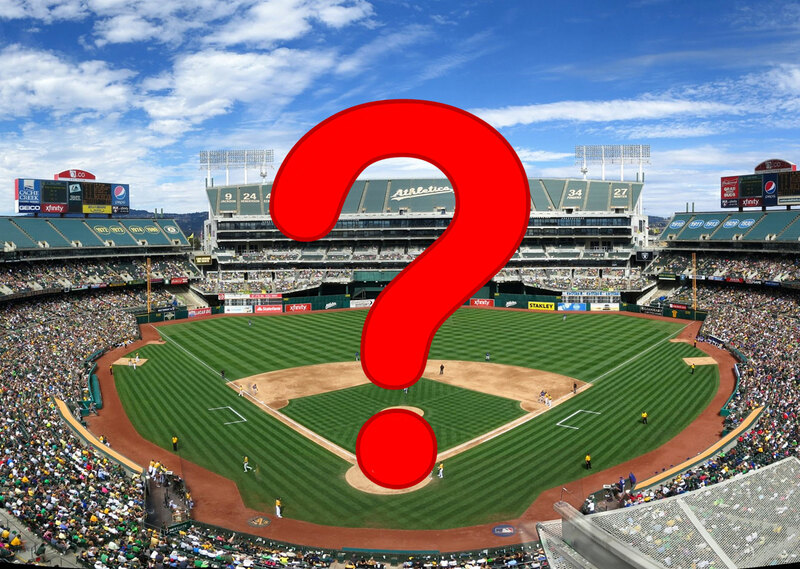 But the athletics are also interested potentially in relocating entirely to a site roughly two miles away called Howard Terminal. Howard Terminal is an existing shipping port that is due for redevelopment. The team has been scoping out a variety of sites in the area as well, including a recently abandoned plan to potentially relocate to the nearby Peralta Community College campus. The scheme was abandoned when its announcement drew forth a great deal of heated opposition when first made public earlier this year. The city’s exclusive agreement allows the municipality to help the Athletics pursue both options concurrently. After today’s meeting, Schaaf said, “I am so excited to be supporting exclusive negotiating agreements at both the Coliseum and at Howard Terminal so that we double our changes to [keep the team].” City and team leaders are hoping to have a final purchase agreement for one of e sites by the end of the year. 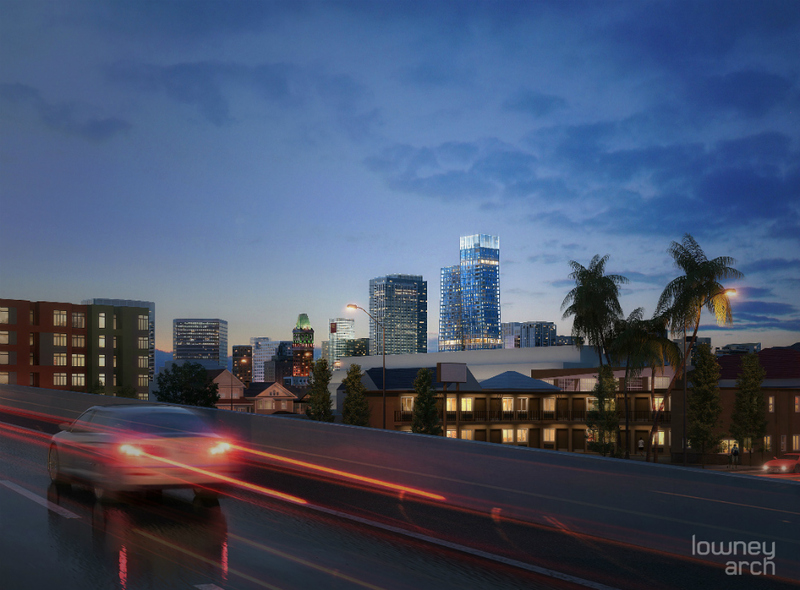 A new project under development by Oakland, California–based Lowney Architecture and developer Pinnacle RED aims to bring the East Bay its newest—and tallest—mixed-use tower. The forthcoming 36-story tower will be located at 1261 Harrison Street and will bring 185 apartment units, 120,000 square feet of Class A office space, and 12,000 square feet of commercial uses to downtown Oakland, potentially transforming that city’s downtown Chinatown neighborhood. The 440-foot tower is billed as the city’s only mixed-use tower under development that combines commercial functions with affordable and market-rate housing under one roof. The arrangement is a by-product of the development’s utilization of a density bonus, which allows the developer to build taller and more densely in exchange for providing affordable housing units on-site. The complex will be anchored on the ground floor by a market hall–style food court with a “locavore” focus. The tower is designed along the street to match the massing and “neighborhood rhythm” of surrounding commercial storefronts, according to Ken Lowney, principal at Lowney Architecture. The 11 floors above street level will be occupied by office spaces with the uppermost levels containing condominiums and maisonettes. 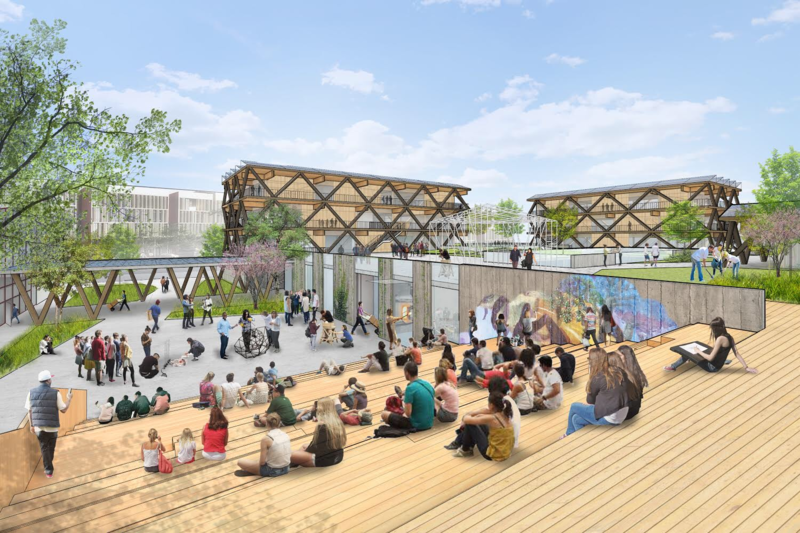 Lowney told The Architect’s Newspaper that the lower level will house community-serving establishments that could potentially include current retail tenants occupying an existing commercial structure on the site that will give way to the development. Under the potential plan, a local bicycle shop will return to manage the building’s 185-stall bicycle parking facilities, for example. The project provides an automated 185-stall underground garage, though parking is not required for the site. The gridded glass tower complex grows from its contextual base in a canted fashion, splitting into two alternating masses as it rises up. The tower’s bifurcated facades are wrapped in a gridded frame that extends the depth of the building’s curtain walls out from each facade. The non-structural application of these gridded frames is a leftover from earlier design iterations that called for an externally-structured tower. Instead, the building is held up by internal beams and columns, a shear core, and moment frames. The glass panels that infill these frames are decorated with multicolored metal panels that are designed to reference surrounding conditions, with warmer, brick-like tones coloring lower levels and clear-blue panels populating the uppermost sections of the tower. In a statement, Mark Donahue of Lowney Architecture said,“We strove for a distinctive design by breaking up the building’s mass so that it appears as two towers, but is really one structure,” adding that the tower was designed to “match the façades of nearby, character-rich buildings.” The development is currently undergoing planning approval. 1261 Harrison Street is expected to take roughly two years to complete once plans are approved. Like a big house accommodating different family members, the new Kapor Center needed to support three distinct-but-related organizations: Kapor Capital, the Kapor Center for Social Impact, and the Level Playing Field Institute. Each needed to share modern offices and venues for gatherings, tours, and discussions, all in one building, but without leaving each function isolated and cut-off. Additionally, the design had to fit within an existing 1920s building on an irregular site in the heart of Oakland, California. All three groups are dedicated to increasing the tech industry's diversity, though approach the challenge from different angles: Kapor Capital invests in companies that address social inequalities, the Center builds partnerships to increase Oakland residents' access to the tech sector, and the Institute tackles barriers to minorities learning STEM subjects. 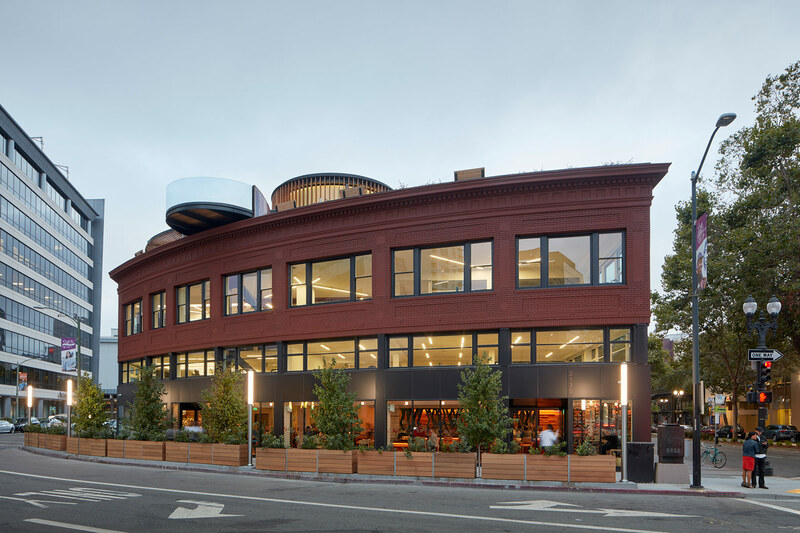 All three groups are also the work of tech industry veterans Mitch Kapor and Freada Kapor Klein; the husband-and-wife team held a design competition and tapped San Francisco–based Fougeron Architecture to build a new Center to consolidate their efforts. "We love mission-driven architecture," said firm founder Anne Fougeron. "For us, it represents, in some ways, the furthering of the missions we had with Planned Parenthood," a longstanding and repeat client for Fougeron Architecture. At the heart of Fougeron's pitch were two cylindrical volumes located atop one another that could unite the project's diverse programming. The bottom volume connects the ground floor to a lower level that features a double-height auditorium. The upper volume, which cuts through a range of workspaces, is topped by a channel glass oculus and an extensive rooftop terrace. 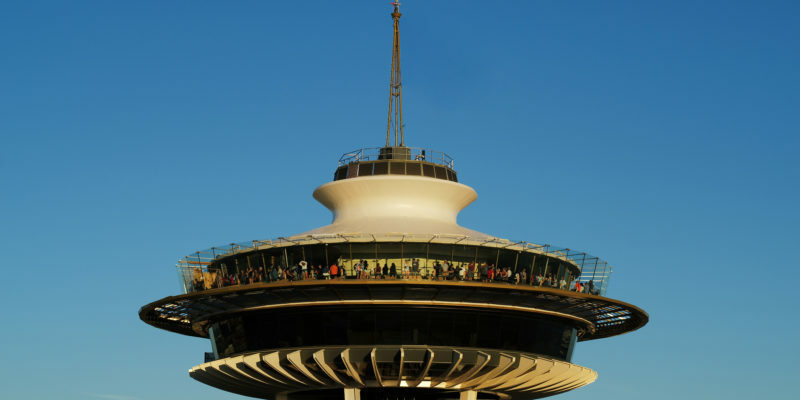 The Kapors were sold: "I wanted to create some verticality... connections between the floors, but also visual connections that you remember," Fougeron said. "Almost a mnemonic device. You would always feel, while you were in the building, that you had an understanding of what the floors were like and what people were doing there." In addition to creating an open and democratic environment, the volumes could impress visitors and host the diverse social functions that come with the business and nonprofit world. "Freada wanted this integrated building, one that had a fair amount of pizzazz," added Fougeron. "She wanted something people would walk into and go 'wow.'" The 45,000-square-foot project's biggest challenge was the existing structure, which had been repeatedly remodeled over the years. But demolishing it wasn't an option: "For [the Kapors], reusing the building is about this respect of place in Oakland." Reusing 75% of the existing building also helped the project attain LEED Gold certification. Other sustainable features included bicycle parking, low flow fixtures, natural ventilation strategies, and recycled materials such as glass tile, redwood, and carpet tile. The newly-added fourth floor, in addition to its green roof, drought-tolerant plants, and heat-reducing wood decking (all other LEED pluses), features the oculus itself, which glows at night. The illuminated capstone not only distinguishes the Center but simultaneously symbolizes its "role to grow outward and upward within the community," as the firm wrote in a press release. This week, the Rockefeller Foundation awarded $4.6 million to the Bay Area: Resilient by Design Challenge team, a collection of San Francisco Bay Area organizations looking to use a public competition to develop approaches for fortifying the region’s infrastructure against the growing threat of climate change and sea level rise. 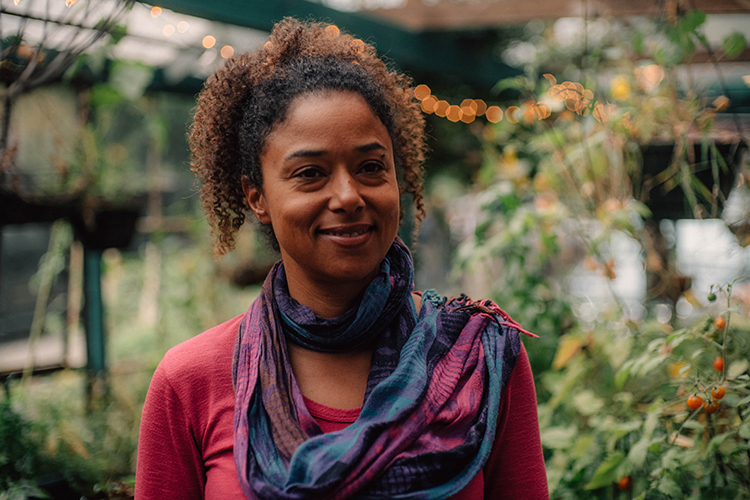 The funds will allow this collection of municipal and non-profit organizations to develop regionally- and ecologically-focused infrastructural resiliency schemes throughout 10 sites spread across the Bay Area. The competition timeline will be divided into two phases. First, starting in April, the teams will participate in a three-month-long research and community engagement exercise aimed at developing initial design concepts for the specific sites with a "multi-faceted approach to resiliency." The teams will then have five months to design—working with community members and local municipalities—implementable infrastructure projects. Bay Area: Resilient by Design Challenge is modeled after the Rockefeller Foundation’s Rebuild by Design Hurricane Sandy Design Competition developed in the aftermath of the devastation caused by Hurricane Sandy on the eastern seaboard by the United States Department of Housing and Urban Development (HUD) and The Rockefeller Foundation in 2012. 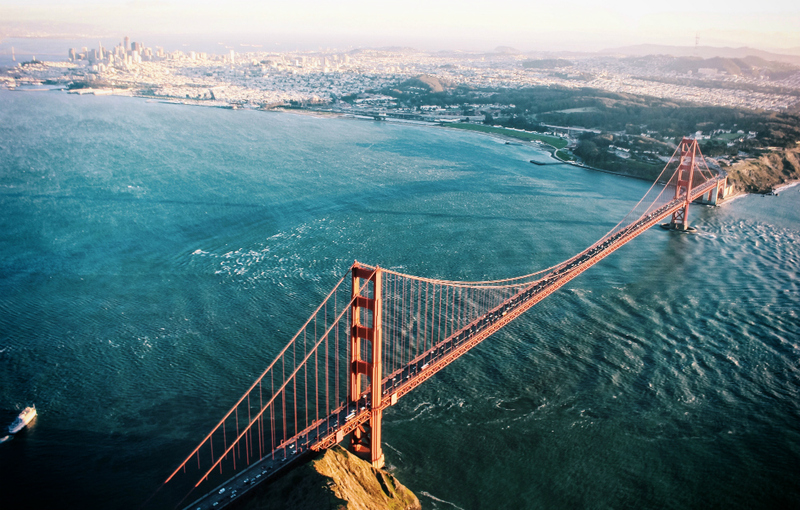 Bay Area: Resilient by Design will work closely with The Rockefeller Foundation’s 100 Resilient Cities network, which is organized to assist 100 cities around the world in building urban resilience. The Bay Area region is home to three network cities—San Francisco, Berkeley, and Oakland—and is already in the midst of planning for future perils. Those three cities worked in 2016 to develop future-oriented resiliency strategies that will now influence the forthcoming competition. Allison Brooks, executive director of the Bay Area Regional Collaborative (BARC)—an organization that coordinates the planning efforts of the Association of Bay Area Governments (ABAG), the Bay Area Air Quality Management District (BAAQMD), the Bay Conservation and Development Commission (BCDC), and the Metropolitan Transportation Commission (MTC)—speaking to The Architect’s Newspaper over telephone, said, “We’re bringing in people from all over the world who have been grappling with this issue." Brooks and fellow organizers behind Bay Area: Resilient by Design Challenge will spend the next several months identifying sites across the Bay Area to feature in the competition while also working with local communities to identify specific needs. Brooks added, "We're not responding to a catastrophic disaster but a slow-moving disaster. The region has organized its most dense development and valuable infrastructure around a Bay that is expanding as a result of sea level rise.” Recent studies indicate that the level of the bay may rise between three- and four-feet between now and 2100. The nine-county region surrounding the San Francisco Bay is home to roughly 7-million inhabitants and is especially threatened by sea level rise, as many of the region’s key population and economic centers are located along the bay itself. For more information on the competition, see the Rebuild by Design website.